Not long ago, while writing about the launching of the 1,500TH 42- foot Grand Banks, I wondered in print about the whereabouts of the first GB42-a woody built in 1965-and expressed hope that she still was in great shape and keeping people happy. It turns out she is. Named Magdalena, the first 42 built by Grand Banks in Kowloon, Hong Kong, now is a dive charter boat operating in the Baltic Sea off the east coast of Sweden. Her home port is Arkösund, Sweden, a small fishing village about 80 nautical miles south of Stockholm. Her owner is Jan Sangrud, who lives in an old lockkeeper&apos;s house at the Tegelbruket lock on Göta Kanal, an 1832-vintage manmade canal that slices through Sweden to link the Baltic with the Atlantic Ocean. During the summer season, Sangrud takes up to 10 divers on day trips aboard Magdalena. She also is rigged to carry six divers and a crew of two on three-day diving adventures. The sedan-style GB was shipped to Sweden from the United States in 1989. Her previous home port had been Galveston, Texas, and when Sangrud first saw the yacht in 1996 in Sweden she still was equipped with a fishing chair in the cockpit and outriggers. "The boat was in a terrible state," he adds. 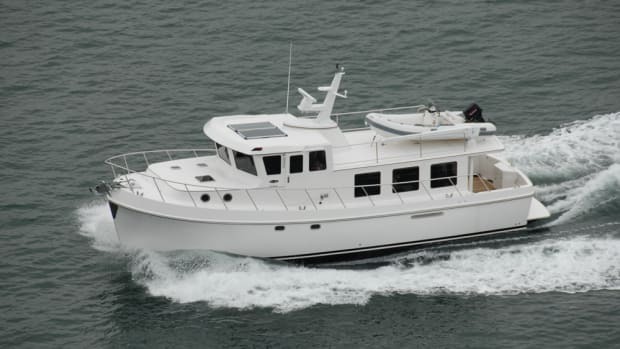 Although Magdalena needed significant updating and repair to prepare her for a charter career, her 370-horsepower Cummins diesels were in good shape and capable of pushing the old yacht to a cruising speed of 11 to 14 knots and to 19 knots at wide-open throttle. "After hard negotiations with the seller, I finally bought her for a price that reflected her state, rather than what the seller started out wanting," Sangrud says. The boat was based in Malmo, Sweden, and Sangrud faced a 340- nautical mile trip from the south tip of Sweden up its east coast. "The existing navigation equipment was one bad compass and a small radar that didn&apos;t work," he recalls. "Before we started the trip home, I installed a GPS, a VHF radio, bought a big emergency bilge pump and filled her with 2,800 liters of diesel fuel." It was late October, so there was the possibility of nasty weather. "The boat hadn&apos;t been to sea in a long time and I didn&apos;t know the boat, so I decided to sail only during daylight," Sangrud says. "We started on a nice, sunny day with cold weather and a calm sea. We pushed the throttles to 2200 rpm, and Magdalena cruised at 11 knots with a big swell behind and a powerful sound from her two big V8 engines." Then the GPS went blank. Troubleshooting revealed that a voltage regulator was running wild and pushing 17 volts of DC power into the boat&apos;s electrical system. The GPS was dead and the VHF radio damaged, leaving Sangrud and his volunteer crew to finish the trip using basic navigation skills and cell phones. The reverse-cycle cooling/heating system didn&apos;t work. To keep warm at night, the crew opened the engine room hatches. With the heat came the aroma of hot lube oil and diesel fuel. But they were comfortable. On the fourth day, they turned into Göta Kanal and motored through two navigation locks to Söderköping, where refurbishing began. Sangrud&apos;s first winter of ownership was devoted to renovation of the engine room and electrical systems. The restoration would extend over three winter seasons. Although the engines were good, they were pulled out to allow unfettered access to the engine room. The old 12VDC and the American standard 120VAC wiring were stripped away and replaced with new 12-volt and European standard 220/380VAC systems. New pumps, valves, air conditioning and other equipment were installed, and the engine room was repainted. A certified helicopter/aircraft engineer, Sangrud did much of the work himself, laboring almost full time during the cold Swedish winters. He hired skilled help, however, for conversion of the Onan generator and the rewiring of the boat. "I also hired a good friend, a retired boatbuilder, when it came to advanced &apos;wood-pecking,&apos; " Sangrud adds. 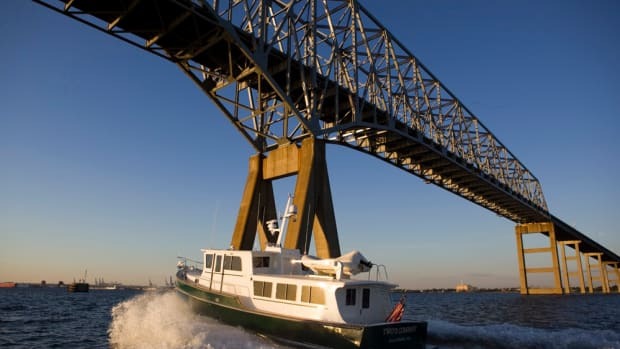 The mechanical shaft steering equipment was replaced with a hydraulic system and coupled to a Neco Marine 628 autopilot and joystick steering at both helm stations. Sangrud repaired bad wood in the deckhouse, rebuilt the helm stations and replaced beds in the forward stateroom with bunks for divers. The saloon was equipped with new furniture, including tables that would convert to berths for two. He then loaded the lower helm station with an impressive suite of electronics equipment: A JRC-JMA-2254 radar with a 3.9-foot open-array antenna, a Raytheon V850 color depth sounder and a Raytheon 398 DGPS-as well as a Sailor RT VHF radio and a C-Map Pro, a personalcomputer chart-plotting system. Magdalena received a diver&apos;s ladder on her swim step, and a steel plate was laid in her cockpit to protect the teak decking from dropped air tanks and other gear. Stainless steel reinforcing was added to strengthen the joint where hull planks meet the transom. "Today, Magdalena is a popular dive chart boat," Sangrud says proudly. "I do the first tour of the year in late April, when ice normally is gone, and I end the season in early October. "During the winter, she rests under a tent in a drydock. I believe it is very important to bring an old woody ashore and let her dry before the mercury creeps below zero." While the GB42 sits in a protected shelter, Sangrud plays-skiing and ice skating through the long Swedish winter. No one knows how many owners have enjoyed cruising aboard the first 42 Grand Banks, or when she was named Magdalena. Sketchy records at the U.S. Coast Guard Vessel Documentation Center affirm that she was built in 1965 for an owner identified as S. Stassi. John F. Newton Jr., a son of the founder of the company and its designated master carpenter, signed her carpenter&apos;s certificate. Stassi apparently owned the boat into the 1970s. The Coast Guard first documented her when Stassi sold her in 1974. Coast Guard records indicate she&apos;s had several other owners, including one who paid $75,000 for the boat in 1977. She apparently had other names but is identified as Magdalena on the most current Coast Guard documents. Sangrud&apos;s information indicates that her last American home port was Galveston and that she was carried to Sweden on the deck of a freighter. At my request, Sangrud crawled into the bilges of Magdalena and found her documentation number carved into an engine bed timber. It matched the Coast Guard records. Further, Magdalena still carries her original Grand Banks builder&apos;s plate, which describes her as "Grand Banks 42-1, built by Robt. Newton & Sons, American Marine Limited, Hong Kong." I called Bob Phillips about Magdalena. He&apos;s the West Coast sales manager for Grand Banks, based in Newport Beach, California, and has been with GB since 1972. John Newton Jr. was his boss when he first joined the company. Counting on his long history with the company, I asked if he would confirm that the first 42 was a sedan. I said nothing else about the boat. "Just a minute, while I look in a file," Phillips replies, and in about 20 seconds he cries, "S. Stassi. It was built for S. Stassi." While Magdalena is the first 42, the second 42 probably was delivered first, Phillips recalls. Most of the early 42s were sedans, and the U.S. Navy was among the early buyers. We talked more about the boat, and I mentioned she had been repowered with big Cummins diesels. "Now I remember," Phillips says. "I saw that boat in Galveston maybe a hundred years ago. She had those big engines then. "That&apos;s wild. What a small world." Boatbuilders are dreamers and optimists. It&apos;s a tough business, and they need to think cheerful thoughts. But do you believe that the Newtons, even in overdrive optimism, ever contemplated the day when one of their oval builder&apos;s plates would carry four-digit hull numbers? I heard nothing following my published requests for information about Hull No. 1. (See PMM December &apos;02.) But PassageMaker readers were "talking" about my appeal on an Internet message board (www.oya.com) operated by Oxford Yacht Agency, a Grand Banks dealer in Oxford, Maryland. One participant knew about Sangrud&apos;s boat and noted that it was listed on another website, www.gbwoodies.com, one devoted to old Grand Banks yachts. few electronic messages later I was in contact with Sangrud, who worked at his computer in the old lockkeeper&apos;s house about 30 feet from the canal, which then carried an 18-inch ice cover. Sangrud&apos;s experience further proves what many know: The mahogany-planked, yakalframed GBs are tough old birds, and love, money, time and perseverance-and probably a wall-to-wall renovation every generation or so- will keep them looking good and running smoothly. As for the boat, Sangrud is more than satisfied with her. "All boats are compromises," he says. "I consider Magdalena to be a good compromise. I don&apos;t like her zigzag in following seas (he&apos;s not the first GB owner with that complaint). But I guess that is the nature of the lady, and there&apos;s nothing to be done about it." He&apos;s also aware that he has the important role of protecting and nurturing a historically important vessel-the GB42 that was the first in what has turned out to be the most popular line of boats ever built.